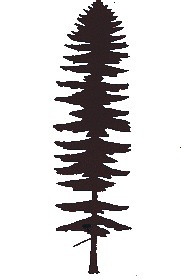 The Pacific northwest native firs are varied in appearance, environmental requirements and size. Their cones are large and tightly constructed, dropping whole from the tree and maturing on the ground. There is one exception: Noble Fir cones ripen upright on the tree, disintegrating there and falling to the ground in pieces. They range in size from 80 to 200 feet when fully mature in the wild, but are often considerably smaller in the garden. This gorgeous Noble Fir photo was taken at Mt. St. Helens by Mamausings. As yet, not all northwest native firs are covered in this website, though that may be done some time in the future. For now, we have information about only five of our northwest native firs. Pacific Silver Fir (Abies amabilis): It is a rare occurrence to find this northwest native tree available in nurseries. The underside of its leaves are silver, and so is the bark. The cones are deep purple, With the typically deep green on the top side of the leaves, the silver and purple attributes are a regal combination and quite beautiful in the landscape. Perhaps that is how it gained the common name of Lovely Fir. Although it grows to 120 feet tall in the wild, the height is more often 50 feet at maturity. 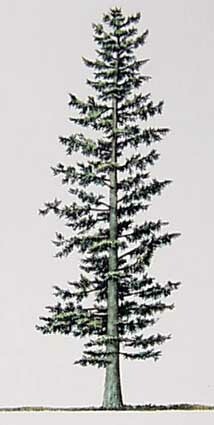 White Fir (Abies concolor): Commonly found in Oregon and California, very tall at maturity--75 - 120 feet. A stunning ornamental with silvery blue to almost white needles, brightens dark areas of the landscape. Very hardy but will not tolerate pollution or any form of pesticide, herbicide or fungicide making this a natural choice for wildlife habitats. Grand Fir (Abies grandis): Stately landscape tree, the quickest growing of all fir species--can gain as much as 3 feet in one year and reaches 200 feet at maturity. The branches are lush and thick with dark green glossy needles, new growth is bright green. The discreet lemon-lime fragrance gives the garden a fresh, clean smell. Subalpine Fir (Abies lasiocarpa): This fir has a large natural range, growing from the Yukon to New Mexico and west to the Pacific coast. It grows slowly to 80 feet at maturity in the wild, though it is a bit shorter in the landscape. The needles are blue to gray-green in color. Noble Fir (Abies procera): Branches of this fir are straight out from the trunk and are spaced apart, giving the tree a structured appearance. Needles have a blue-green tinge and are thickly distributed along the branch. Whereas the cones of other firs are tight and fall to the ground in one piece, Noble Fir's disintegrate while on the tree so that the separate seeds are easily harvested by wildlife.